I’ve just returned from a week of meetings of indigenous interfaith representatives in Tepoztlan, Morelos, Mexico. This was a follow-up meeting to the one in Guatemala on which Rachael reported last January. At that previous meeting a group of representatives of many indigenous spiritualities agreed that there are a significant number of issues and concerns that have not adequately been addressed by the existing large interfaith groups – the United Religions Initiative, the Parliament of the World’s Religions, et al. – and that probably could not be addressed in these organizations in the near future. 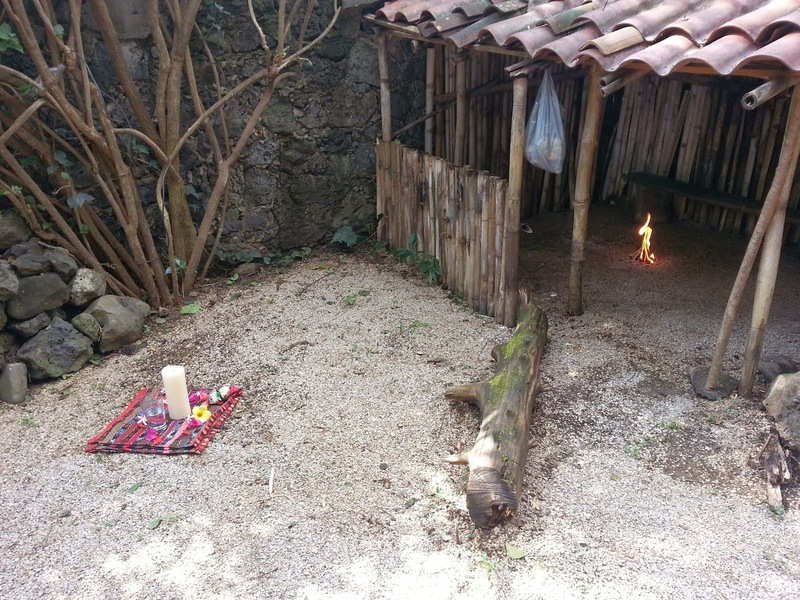 Accordingly, many felt the need for a new, independent, global organization focusing on the unique challenges and opportunities of indigenous spiritualities as its primary concern. There is always room for more at the interfaith table and we hope that a new group like this will be welcomed; there will probably be many people who will hold membership in other interfaith groups as well as this new one. This meeting in Mexico was a working group of individuals selected to come up with drafts of a name for the group, a description, a vision, a mission, principles, a logo, organizational design, membership, etc. – all to be circulated to the folks who were at the Guatemala meeting for comment, discussion, input, and further conversation. We plan to have a meeting in 2014 at which the final versions of all these aspects of the new group would be confirmed. Tata noted that: “The new organization began in December 2012, with the coming together of a new Baqtunic era of the merging of the Eagle, the Condor and the Quetzalcoatl (feathered Serpent) to actualize the prophesies that exist in many indigenous communities such as the Maya, the Hopi, the Aborigines in Australia and many more." Most of the first day – Wednesday – was spent getting everyone to Jonathan’s. With numerous delayed and even canceled flights, Yoland, Raul, Tata, and I found each other in the Mexico City airport over the span of nine hours. As the time passed and we waited for word of Tata, we started contemplating spending the night on the airport sofas. I arrived at 2:53pm and Tata didn’t get into the Mexico City airport until 10 minutes after midnight... 20 minutes before the last bus to Cuernavaca, our next stop, pulled out! 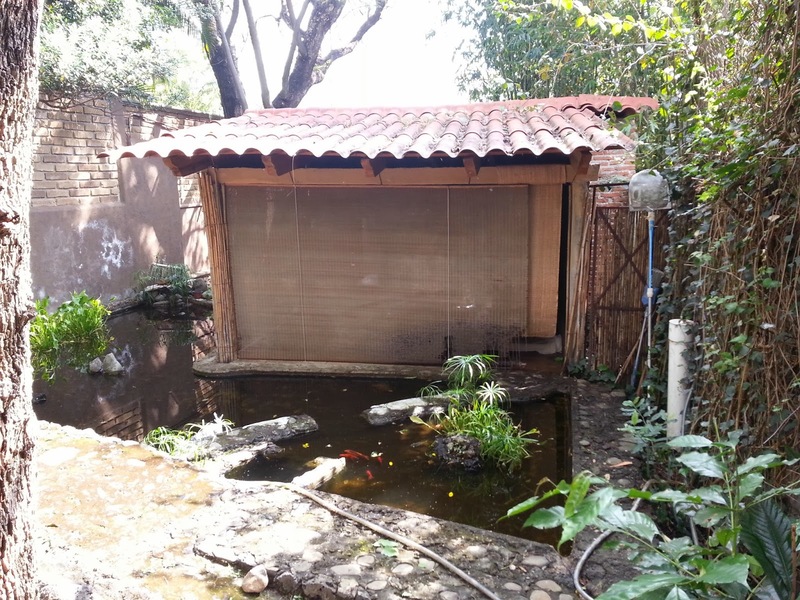 Two hours later, we met Jonathan and Margarita in Cuernavaca for a half-hour drive to their house. Driving through Mexico City in the middle of the night was very strange – with the streets looking like set pieces out of a Val Lewton film. There were no lit windows looking out onto the mostly-deserted streets. Doors and windows had metal shutters pulled down over them. Here and there, bits of light could be seen sneaking around the doors to enclosed compounds. While now and then there would be a street-light, businesses don’t leave lights on inside their stores like so many do in the US. It gave the city a singularly empty, apocalyptic feeling and I could well imagine zombies stalking down the streets – so unlike the vibrant street life during the day. By the time I got to bed it was after 4am, but fortunately no one was inclined to get up too early and I slept in ‘til 10am on THURSDAY. The cathedral around the corner conveniently rings the time on its bells every 15 minutes – but I slept through it without trouble. 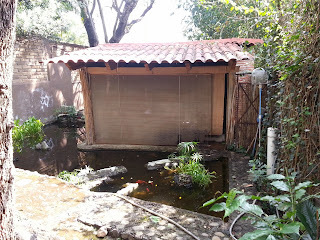 We started with a meditation in Jonathan’s secret tea house, hidden behind a wall at the back of his garden. Tata's ceremony - two fires. This was followed by a Mayan ceremony led by Tata. I wore my cord as a Gardnerian and a hat loaned by Jonathan, since head coverings for men are preferred in Tata’s practice. When the time came for individual prayers, I offered a modified version of the Wican “Dryghton Blessing”. All of us were giving thanks for managing to finally make it to this place and asking blessings on the work we would be doing over the next few days and in the future. 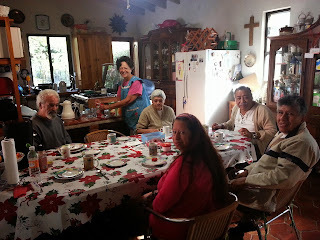 After a wonderful breakfast, prepared by Jonathan’s wife Margarita and housekeeper Gudelia, Jonathan showed us around, since Tata had not been here before. Jonathan took great pleasure in showing me the new sign outside his kitchen door – a witch on a broom with a switchable sign saying "The Witch is in / out.” It became a ritual for me to change the sign every time we gathered for meals. We got to work around a table on the veranda of Jonathan’s guest house, outside Yoland’s room. Tata and Yoland had brought gifts of sweets wrapped in colored leaves and traditional cloth. While this veranda is a very nice place to work, it can also be distracting, since the view of the surrounding mountains, with the pyramid of Tepozteco over all, is spectacular. The mountains above Tepoztlan -- white pyramid in the center. Jonathan was our host, but also helped with translation. Raul and Tata speak their own languages and Spanish. Yoland and Jonathan speak Spanish and English. I speak English and can understand a lot of Spanish, but cannot speak it fast enough for conversation. Also, Tata’s Spanish is heavily accented by his native Mayan and can sometimes be difficult for me to catch. We started by reviewing the long history of indigenous organizing that had led to this point, including local work in Latin America, connections made through various URI entities (the Indigenous & Earth Wisdom MCCs, the Spirituality & the Earth CC, and the Global Indigenous Initiative), connections made through the Indigenous Forum at the United Nations and affiliated groups, the work of the Lost & Endangered Religions Project, and several other organizations, but all coming back to personal relationships that had been forged over the years. We shared our personal stories of involvement in indigenous organizing. All of us expressed concern over the simultaneous de-valuing of traditional wisdom in our own communities while at the same time the New Age market creates a financial incentive for watered-down, corrupted versions of that wisdom to be packaged and sold to the public. After lunch, we reconvened in Yoland’s room, where we could put papers up on the walls and an easel for easier discussion. • What do I offer our group? • What hopes do I bring to this meeting? • What would I like to have achieved after the meeting? We went around the circle deosil (and all commented on how weird it is that interfaith groups seem to always go counter-clockwise in their meetings). Each of us spoke about the paths that had led us here, our enthusiasm for and heart-felt connection to this work, the connections we have within our own communities, our concerns regarding the enormity of the task of creating a truly global network with what seems a paucity of resources, and how much we hoped to get done in just a few days. It seemed that each person came back to their own culture’s version of the aphorism: “Never doubt that a small group of committed people can change the world… because it’s the only thing that ever has.” Raul spoke of this in terms of being in alignment with the Mother. Yoland used a metaphor of a stone dropped in a pool of water creating ripples. I suggested that we think more of a drop of water creating ripples, since the drop becomes part of the substance being rippled. After hearing the answers from Jonathan, Tata, and Raul, our exhaustion from the previous day of travel was catching up to us (and it was three hours later by Raul’s internal clock), so we broke for dinner and bed. FRIDAY opened with a meditation in Jonathan’s tea-house, followed by a healing treatment from Tata. (Many readers know that Tata has been treating me for the results of s surgical accident in 2007 that has severely limited my activities. His treatments have been the only things that have produced lasting effects. My neurologist says, “Do whatever he says!”). After some divination, some ceremony, and some “Maya-practy” bodywork, we went for breakfast. We resumed our meeting and Yoland and I answered the four questions. Yoland and I both spoke about walking in two worlds – that of indigenous spirituality and that of the corporate, technocratic West. 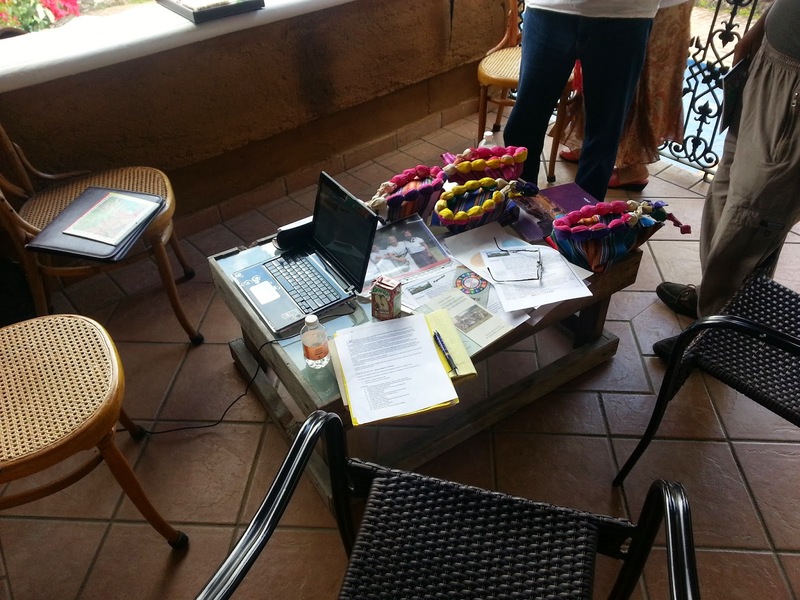 We both spoke of our experience with non-profit organizations and about our own organizations. She founded the Pasadena / Altadena Coalition of Transformative Leaders (PACTL, pactl.org) and has worked with the United Nations, among others. I founded the Lost & Endangered Religions project and have contributed a lot to the Bylaws and organizational design of several organizations. Both of us have extensive experience in the URI – Yoland was Global Council Chair for two terms and I am the only Trustee to have served on all four terms of the Global Council. Both of us have access to funders, resources, and world-wide contacts. * How did this group relate to the meeting in Guatemala? 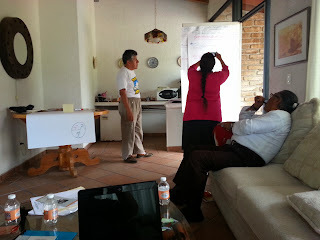 This was a more focused group intended to draft core concepts to take back to the folks who had been at the Guatemala meeting for their consideration, discussion, and input. Nothing would be final until the whole group agreed. * How would membership work? Would we have individual members? Organizational members? Both? What would the likely criteria be? * Indigenous organizations have always had difficulties with communication. Electronic communication is necessary over such large distances, but many people do not have internet capability, or if they do, they don’t have reliable infrastructure supporting it where they live. * We discussed possible names for this new group. After some time, we came up with a name that is simple, poetic, evocative, and should translate easily into many languages. It will be circulated among the members of the Guatemala group for comments and, hopefully, approval. -- When a local group found that plants needed for ceremony were becoming extinct, they organized the creation of their own gardens where such plants could be grown for ceremony and the excess packaged and sold. -- A similar project was created to make the special fabrics for ceremonial garb. -- There were similar projects for traditional arts, music, stories, etc. Tata told us that he had written down all the traditional lore that he had been taught in 14 volumes in Spanish. These had been translated into English, but the Spanish version had been lost (under complicated circumstances). He showed us a sample of a couple of the chapters. As I flipped through this, marveling at the intricate Mayan designs, he said that there was only one copy of the English translation! As I started crying / screaming inside, I calmly told Tata that the Lost & Endangered Religions project would be very happy to come down, scan & transcribe the English texts, and maintain copies in a separate location – all for his use only, unless he said otherwise. I couldn’t believe that this treasure of traditional knowledge was so close to being lost forever. This kind of opportunity to preserve traditional wisdom only occurs through interfaith work. This also meant that the Lost & Endangered Religions Project could be an organizational “partner” with “the new group”. We shared stories of small cases of indigenous interfaith organizing making a difference. Yoland had a story from New Zealand. I told the story of the Tabebe from Ethiopia (http://covenantinterfaith.blogspot.com/2010/01/monday-dec-7-430pm-at-2009-parliament.html). 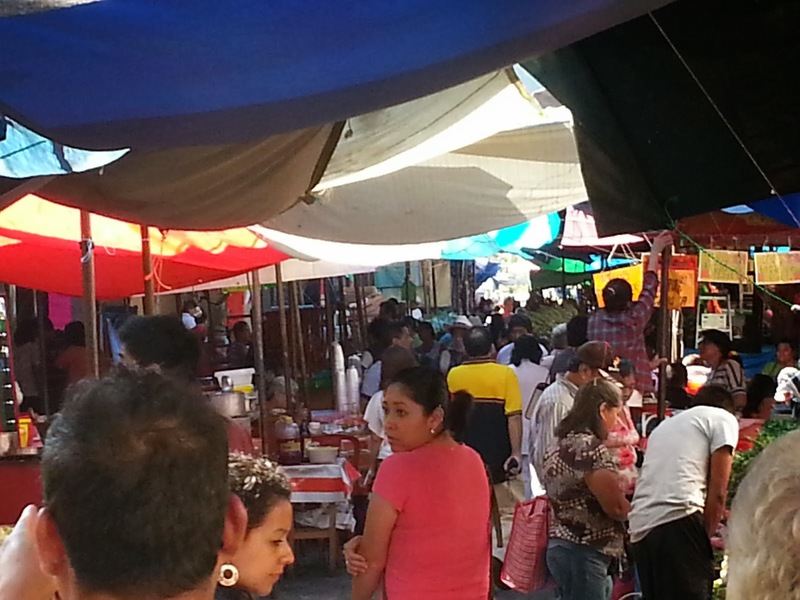 After lunch, we all took a walk to the mercado (market), just a few blocks away. Yoland was delighted to find fruit she can’t get in the US. Tata was delighted to find chapulines (grasshoppers toasted with garlic, lime juice, and salt made with an extract of agave worms). He bought a bag to munch on as we walked and was surprised to find that I have had them before and love munching them, too. Over the next few days, many jokes were made about us eating “bugs”. Back at Jonathan’s and back to work… Over the course of the rest of the afternoon we came up with a draft Vision and Mission statement for the new group. We acknowledged that with the difficulties we have with communication, the process of discussing the proposed name, vision, and mission will take time. We should expect this and not be concerned, since it is the only way that we can make sure that everyone will be involved in the decisions. This goes right to the core of who we are and how we will operate. At this point, it was time for dinner, so we agreed to sleep on the proposed name, vision, and mission and see if anything came to us in the night. SATURDAY opened with the usual meditation, followed by another treatment with Tata. After breakfast, we reconvened. Jonathan said that he was excited by the proposed name and that one of Tata’s projects had reminded him of the project with which he had been involved when he first joined the Spirituality & the Earth CC called “Love & Care of Creation”. It turned out that, after agreeing to “sleep on” the proposed name, etc., each of us had had unusual dreams the preceding night. -- I had dreamed about a benign virus that spread across the world that did nothing but change people’s genders. Some feared it, some embraced it, but most accepted it as part of a new reality. Since it was possible to be re-infected, folks’ genders were constantly changing, resulting in a world of greater balance. -- Raul had dreamed of a mountain cave in which was a Mesoamerican pyramid glowing with many colors. -- Yoland had woken in the night feeling the presence of Sofia, a woman who'd been part of the Guatemala group. She said that she also felt a strong feminine energy manifesting in our work. We interpreted these as being favorable for the name we had come up with. We discussed a descriptive “subtitle” for the new group, something like “A Global Network of Indigenous Spiritualities”, for example. We kicked around many different versions of subtitles, including some sent in from Sofia (indigenous Mapuche / Chile) and from Calixto (indigenous Aymara / Bolivia). We eventually decided on three that would be circulated, but in the process we agreed on an important Principle: Each people would be encouraged to translate not just the words of our materials into their own languages, but the concepts into their own idiom. For example, many of the Latin American groups use the term “cosmovisión” to describe their worldviews, but “cosmovision” doesn’t really work in American English. “Spiritual worldview” might be closer. So, whatever subtitle we agree on, it will be phrased somewhat differently in different cultures. We revisited our proposed Vision and Mission statements and tweaked them slightly, before moving on to organizational design. Raul and Tata each explained how their cultures’ cosmovisiónes related to the possible design of an indigenous networking organization. I explained CoG’s structure and how I view it as a possible way to implement the concepts both Raul and Tata had described. There was quite a bit of interest in this and I will be writing up a description for the wider group to consider. After a break, we started looking at how all of this could be implemented in the following areas: administrative team, communication, resources, development, and capacity building. I suggested a possible logo that could be individually modified to incorporate the symbols and images sacred to each group; for example, in Latin America, the images of the Condor, the Eagle, and the Quetzal are important and could be incorporated. We assigned primary responsibility for the next phase of moving this all forward. I will be working organizational design, communication (especially in English), and resource development. Los Chinelos -- the restaurant. 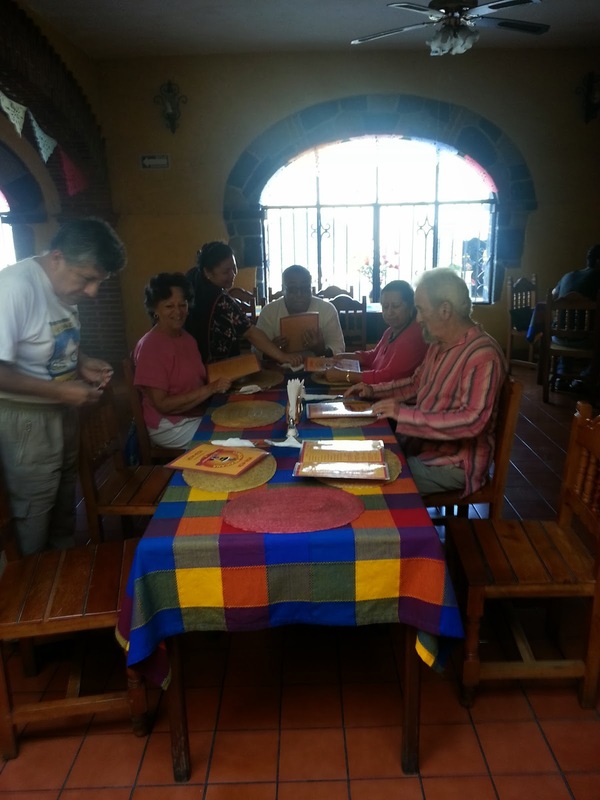 We broke for lunch and the five of us, with Margarita, went to a nearby restaurant, Los Chinelos. Chinelos are local folk figures prominent in a parade and festival that just so happened to be happening that day. They represent conquistadors and each district of the town has their own distinct version of the traditional costume. 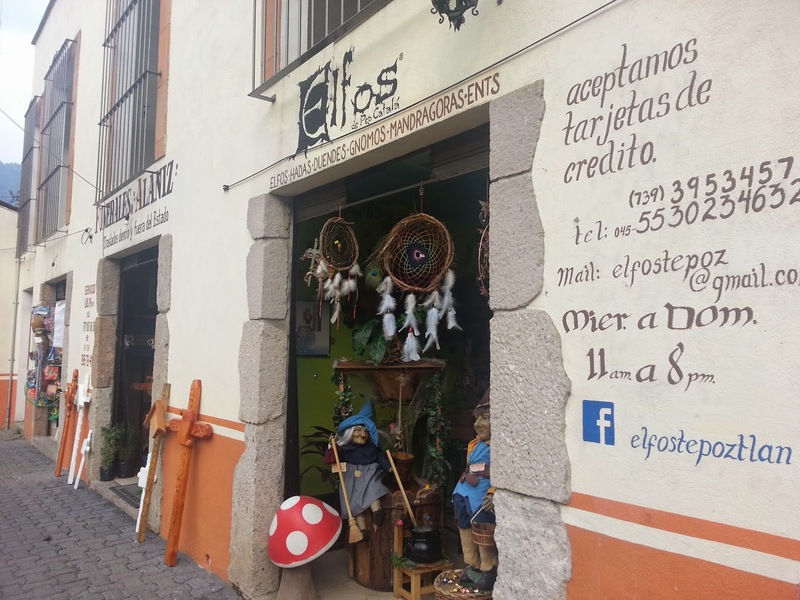 Elfos, with "la madre de Don"
Back at Jonathan’s we continued with our work. Yoland read letters from Sofia and Calixto with input for our meeting. We wrapped things up with preliminary plans for a meeting of the wider Guatemala group next year. Yoland and I will be doing most of the research and fundraising for this event. If we hold it in the US, I hope we can engage some of CoG’s event-planning expertise in whatever part of the country ends up being selected. That wrapped up most of our work and we had a relaxing dinner and evening. 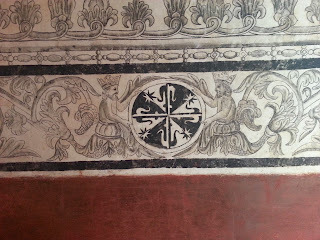 Wall art in the monastery. SUNDAY I didn’t have a treatment with Tata planned, so I could sleep in ‘til 7:30. After breakfast, the “gang of five” met to see if there was anything left to wrap up. After a short session, we all went of to the Cathedral behind the market, a few blocks away. There was a small processional event going on, but we were bound for the museum housed in the old monastery attached to the Cathedral. I had seen the museum before on a previous trip, so I made a beeline for the museum shop, looking for books on local folklore and archaeology that might be difficult to acquire in the States. (Now that I’m opening a library, I always feel like I’m “shopping for two”.) 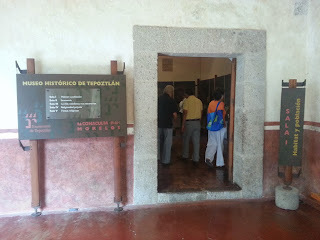 The clerk was very helpful and I found books on local legends, the Maya, the culture & history of Tepoztlan, etc. I was particularly impressed by issues of arqueologia MEXICANA and picked up a couple on Central American calendar systems (after running them by Tata). I think I’ll be ordering several back issues. 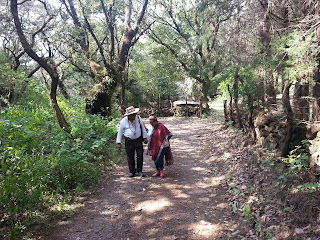 Jonathan and Margarita went back to the hacienda ahead of us, to meet a young man Jonathan had hired to guide us to the Pyramid on the mountain overlooking Tepoztlan. 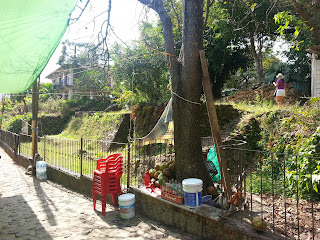 I was charged with making sure that our party didn’t dawdle in the market, but got back before noon to meet the guide. However, Sunday is market day, so the market had doubled in size and was full of temptations. Tata was trapped by two stalls selling various resinous incenses, while Yoland discovered a stall selling her favorite fruit, which she cannot get in the US. I kept up the nudging and we got home by noon, but the guide was late. 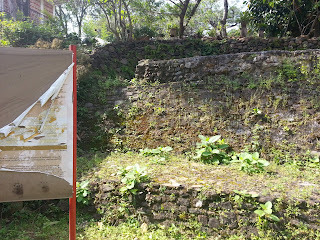 Jonathan suggested that, while we waited, we could take a walk around the corner to see another Pyramid. 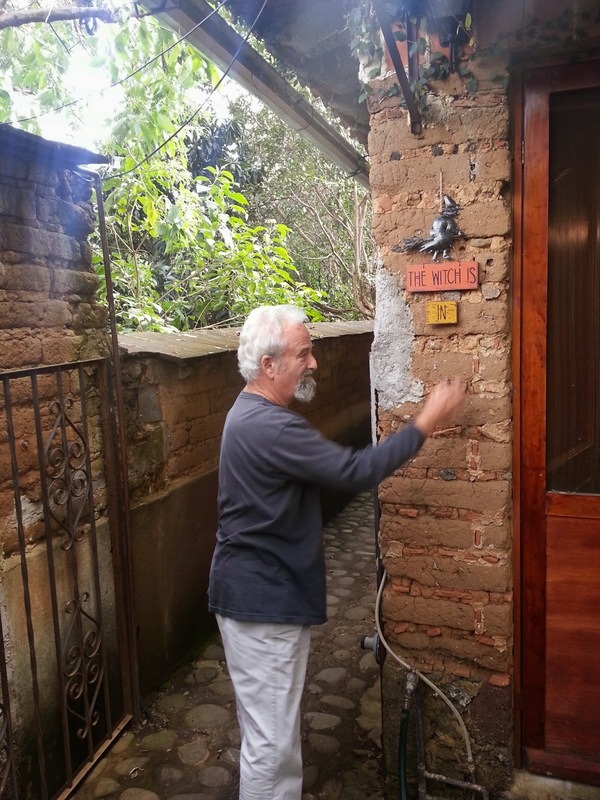 About ten years ago, a local was expanding their driveway when they encountered ancient stonework. Archaeologists were called in and then soon determined that the stone wall was the terrace of a Pyramid… the top terrace of a Pyramid! 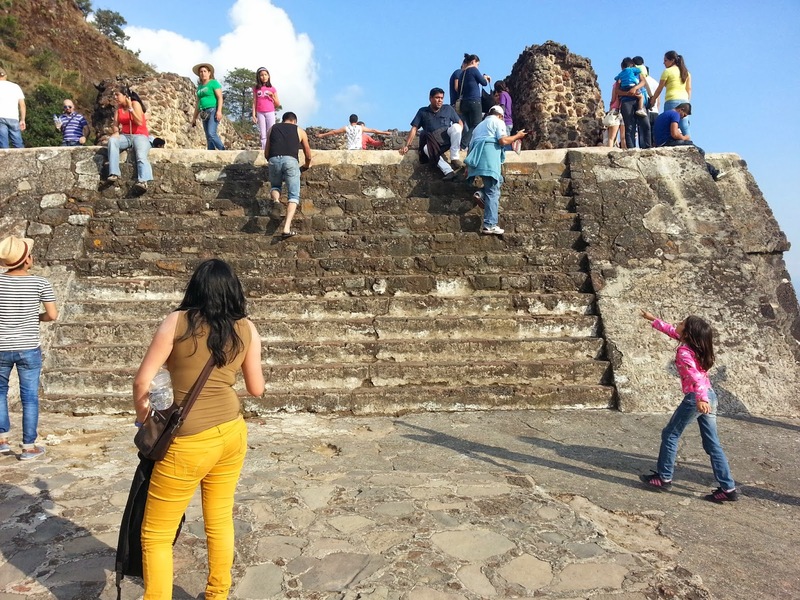 In other words, the now-buried mass of the Pyramid lies under the streets of downtown Tepoztlan. Aside from putting a fence around the terrace and setting up an explanatory sign, no further work was done. When we got to the site, Jonathan was horrified to discover that the sign had been torn and the site was getting lost amid the surrounding stalls and surmounting driveway. Jonathan said that he planned to write the town council about this. 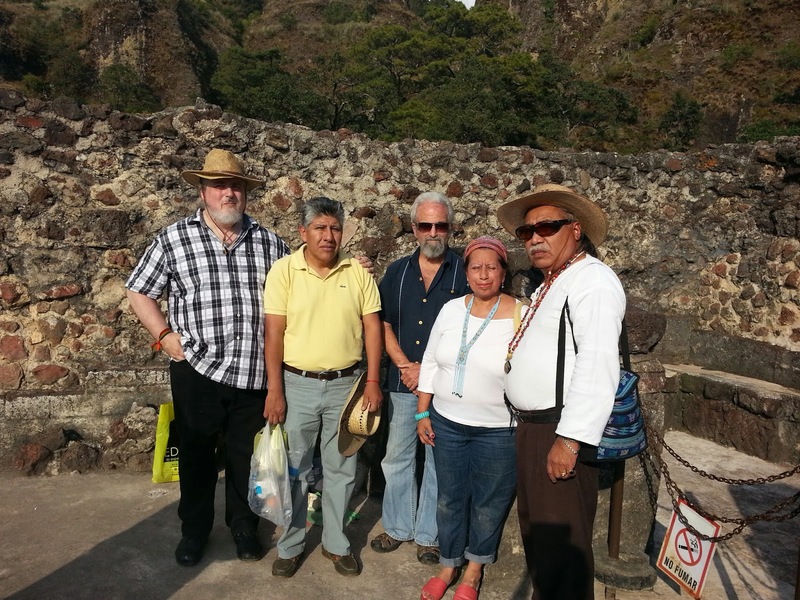 I offered a letter as Director of the Lost & Endangered Religions project, expressing my dismay at this disregard for the rich cultural and archaeological heritage of Tepoztlan. 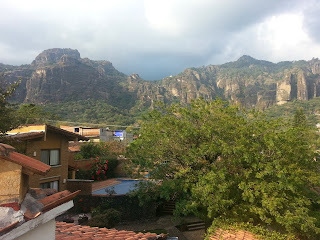 Back at the house, the guide arrived and we all drove off into the mountains above Tepoztlan. Some may remember that I tried to reach the Pyramid on my own a few years ago, but got lost in the mountains. This time, with a guide, we reached the site, but only after nearly an hour of increasingly difficult terrain. 300 metal stairs to the pyramid. 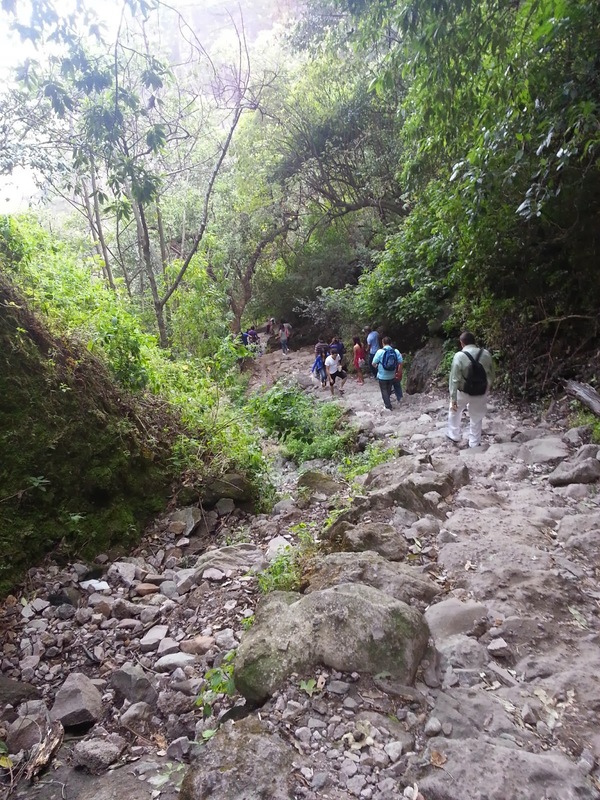 What we had been told would be an easy 20-minute walk was actually much more difficult. With no warning about this, Yoland was in sandals and soon started having real difficulty. We passed a waterfall and I gathered water for the Waters of the World. The last stage of reaching the Pyramid was a 300 step metal staircase. 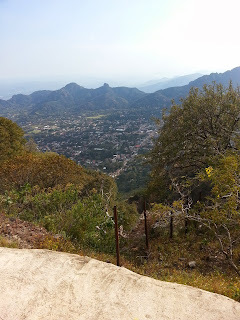 At the base of the stairs, the path we had come in on joined the path that came up directly from Tepoztlan – a long stairway that we had hoped to avoid by driving around and coming in from above. By this time, the locals coming up from town had become a swarm of hundreds of people. 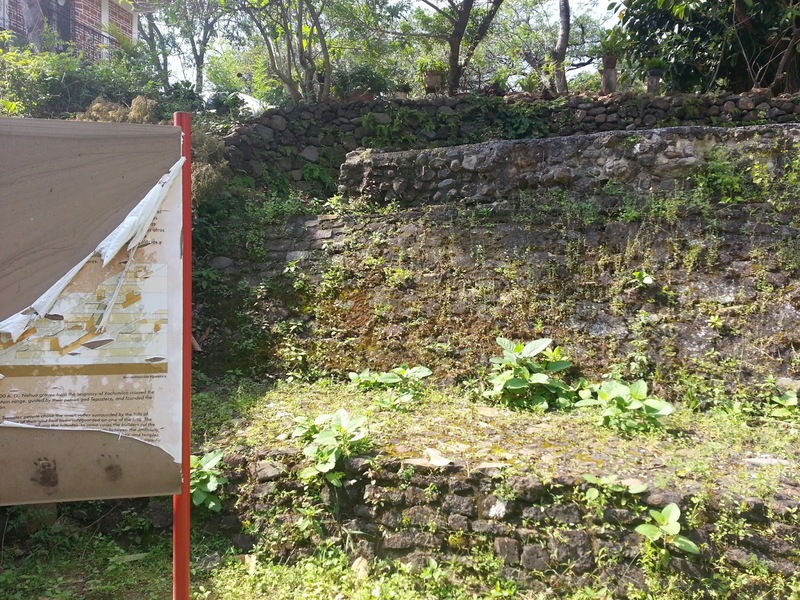 It appeared that the Pyramid was a well-known local picnic / party / make-out site. To make matters worse, some guy was doing aura-cleansings in the center of the Pyramid and blowing a conch every few minutes. 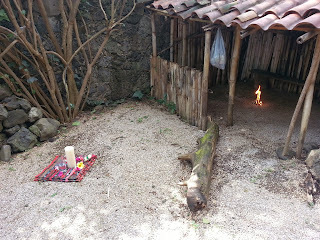 Even so, Tata led us in a Mayan ceremony at the top, using four colors of maize in a quartered circle (barely visible in the photo below) and the Waters of the World. 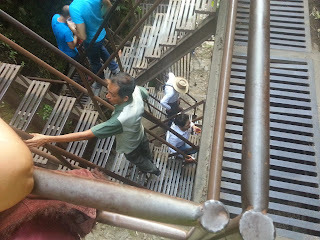 We all spoke with the local spirits about caring for and protecting this place and offered our help. We also got the only photo of all of us together on this trip. None of us relished the idea of revisiting the long trek back to the car in the baking heat. Jonathan said that he would send the guide back to get the car and drive it to his house, while we could take the stairs down to town. This sounded simple enough. It had been so many years since Jonathan had last done this that he had forgotten that the way down was 2 miles of stairs! 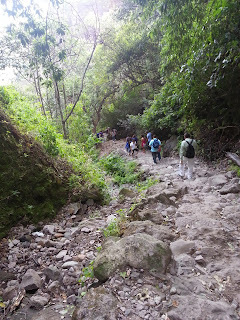 Part of the 2 mile route down. And “stairs” is being generous. 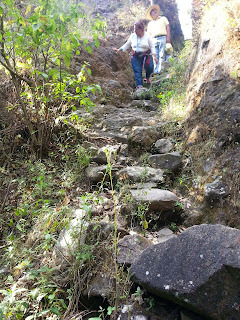 Most of the route was just one rock lower than another – some sharply volcanic, some treacherously smooth river rock, many wobbly, all at uneven heights. While the others got ahead of us – carrying the only remaining full water bottles – I stayed with Yoland. Her inappropriate shoes and shorter legs were making this really hard going for her. After an hour or so in the hot sun, we were feeling seriously dehydrated and wobbly on our feet. Yoland slipped, twisting her ankle and cutting her leg. We moved at a much slower pace and it started getting dark. We grew concerned about being on the “stairs” with NO light. I started seriously considering a med-evac as soon as I could get a cellphone signal. Yoland persevered and as soon as we got a cell signal, we just called Margarita and asked her to send someone up from town with water. Raul arrived about 45 minutes later. We made our way slowly down to town and arrived about a half-hour after sunset. Needless to say, we didn’t hold our planned business meeting that night, but collapsed into bed after a late supper. MONDAY started early with another treatment from Tata. After breakfast, we all got in Jonathan’s and Margarita’s van to visit the nearby site of Xochicalco. 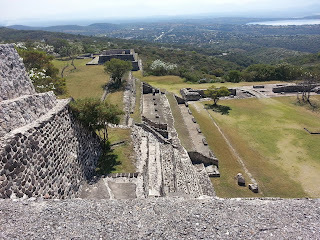 We had planned to visit Teotihuacan, but Margarita had realized that we would spend hours in travel time and had looked for a site closer to home. She and Jonathan had visited Xochicalco – only about 45 minutes away – and been impressed. Hilltop city extending to man-made lake in distance. I am unsure how to report on this site. On the one hand it consists of amazingly preserved structures in a visually dramatic hilltop setting, with significance for the history of astronomy / astrology, including an underground solar / lunar observatory, and with very few visitors and no stalls / shops to spoil the experience. On the other hand, when I asked our guide if he wished the site was better known he said “Absolutely not!” They are happy with the site’s relative obscurity and consequent lack of intrusion by the modern world. In Mexico, commerce usually trumps archaeology and tourist sites quickly get overrun not just with tourists, but the many businesses that serve them – selling souvenirs, fast food, etc. There is only one text on the site in English – a map / pamphlet only available onsite. To respect their wishes and to protect this site for as long as possible, I’ll resist gushing as much as I would like and only show images that have already been shared with the public. Check the site out on Wikipedia. Xochicalco (“the house of flowers”) was the center of a trading network based on the shared worship of Quetzalcoatl / Kukulcan and Tlaloc / Chaac. During its 250 or so years of operation (650-900 CE), it housed Maya, Mixtec, Zapotec, and other communities all at the same time. The site exposed today was the shared administrative center, but each of the participating cultures had their own sectors and all the surrounding hilltops hide the pyramids of their own administrative acropolises. In 743 CE, the astronomers of each of the participating communities predicted a solar eclipse. They came together in a “Congress of the Astronomers” to discuss this and come up with a single calendar for all of them to use. 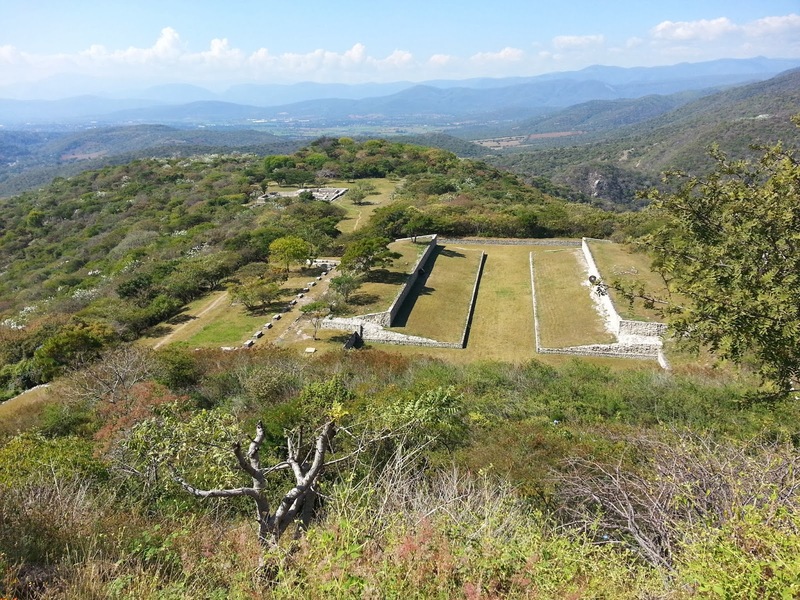 The Temple of Quetzalcoatl was built to commemorate this. It shows astronomers from each of the participating city-states, with distinctive garb and physical appearance, each with an image of a mouth devouring the Moon. Feathered serpents weave them all together. 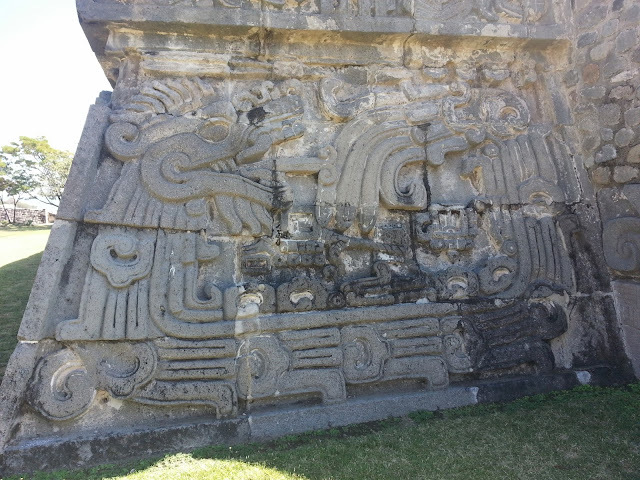 On the front of the temple (in the center of the image above on the right) is a glyph representing the eclipse. From that glyph a hand extends down to our left, pushing away a glyph representing the old calendar. Another hand extends down to our right, pulling a large rope that is attached to a glyph representing the new calendar. 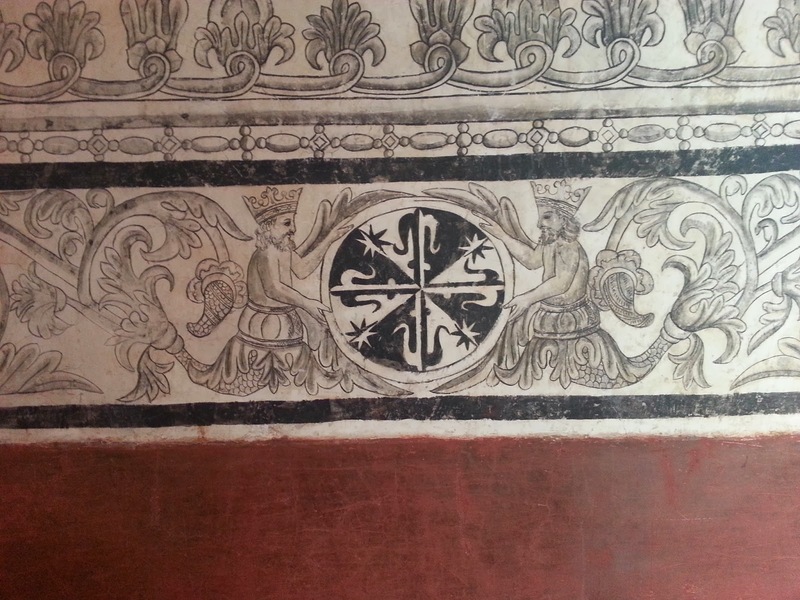 Can you see the hands in the center of the carving? There is also a “Temple of the Pillars”, on the top of which stood pillars inscribed with the new calendar system for all to see. 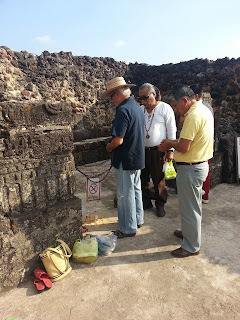 In addition, all the old calendar systems were inscribed on pillars that were buried under the center of this temple.